From Nigel Clark on behalf of the Satellite tagging team. In 2009, Rhys Green and I were tasked with assessing how we could use new technology to track Spoon-billed Sandpipers. We thought that this would be an easy task but the more we looked into how we could safely attach any tag the more concerned we became. With a bird as rare as a spoonie we would not be prepared to risk putting on anything that might adversely affect their chances of survival or their normal behaviour. We initially thought that geolocators attached to a leg ring or a harness to attach a device to the back would be the perfect solution. Such a device would have to stay on for a year for us to get any information so we decided to trial leg loop harnesses on a group of Sanderling on the Wash. The Wash was the perfect place as there was a detailed study of their movements and feeding behaviour being conducted by Chris Kelly at the time so we would be sure that the birds would be seen regularly. 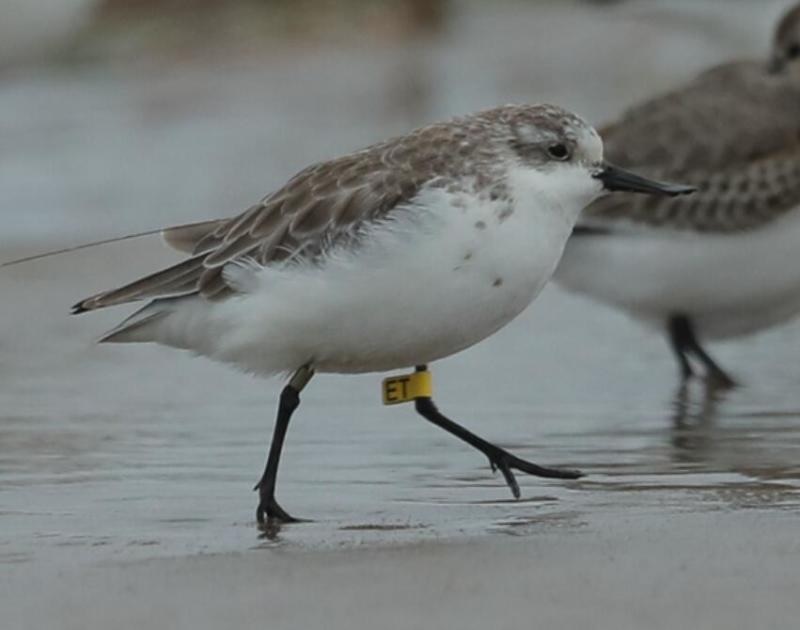 Sanderling migration is very complex and there is a lot that we don’t know so we hoped to fill some gaps in our knowledge of Sanderling as well as trial the attachment of the tags for future use on spoonies. The Wash Wader Ringing Group made a special catch of Sanderling and we selected six birds that had been caught previously in mid-winter on the Wash so we could be sure that they were resident there in winter. We had decided that the most promising attachment method would be to use a ‘leg loop’ harness which would hold the one gram geolocator on the bird’s lower back. All went well with the tagging and we released the birds with high hopes. Chris soon reported that some of the tagged birds were behaving abnormally and it was clear the leg loops were having an effect. It was not long before they started to shed their harnesses. The aim was to re-catch the birds when they returned from their breeding locations in the Arctic. Despite lots of searching only two returned and only one had a tag. The next day the bird was re-caught but to our dismay it had lost its tag overnight! With results like this we could not risk putting tags on the rarest wader in the world so we had to rely on individually marking spoonies with engraved leg flags and hoping that they would be seen in autumn and winter. The results have been fantastic but they will not inform us of any places that spoonies go where there are not birdwatchers searching for them. In the summer of 2015 Paul Howey from Microwave Technology, Inc. announced that he had successfully developed a two gram satellite tag that was powered by sunlight and would give frequent locations via satellite. This was a game changer as we would learn more about the bird’s movements even if the tags only stayed on a short while. Rhys and I discussed the possibilities and thought that gluing the tag to their back would give us info for a few weeks at least. Only a small number of these tags could be produced each year so Paul asked for people with conservation needs for these tags to make a case to him. Forty teams of conservationists applied and Paul selected spoonie. We were uncertain how well a bird the size of a Spoonie would take a tag of 2 grams so we needed to do another trial. 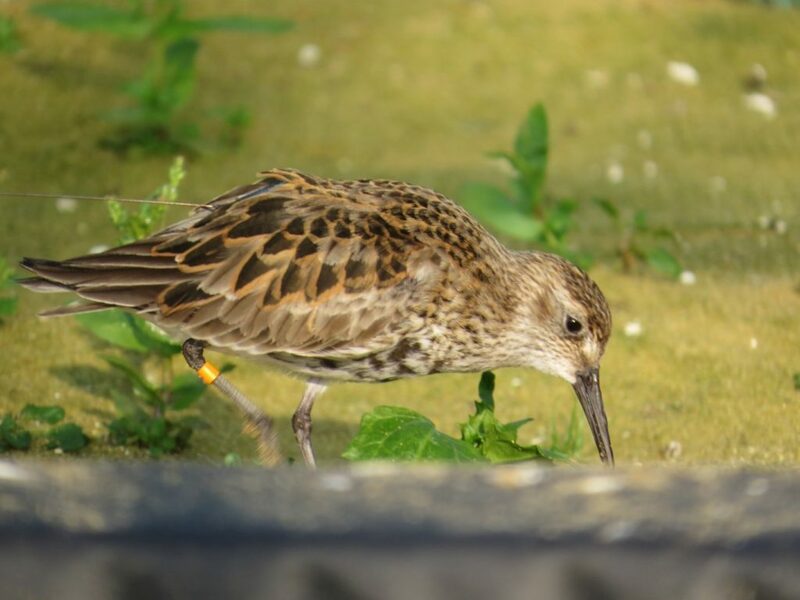 We considered that the best thing to do was to trial dummy and real tags on Dunlin in captivity and, as luck would have it, there were some captive bred Dunlin for sale in Europe. The trial would need a very special aviary as it could not have metal mesh as this would mask any signal from the real tag. This was going to be costly but as luck would have it the Wildfowl & Wetlands Trust had just received a generous gift in memory of a lifelong supporter, which it was agreed would go towards the cost of the trial. In November 2015 the captive flock of 15 birds arrived at the WWT’s quarantine station where they went through a rigorous disease screening protocol. To our dismay they could not be given the all clear so could not go into an area where there were other captive birds. One of the captive bred Dunlin which had been tagged with a dummy tag in March 2016 while in winter plumage. The photo was taken in early June. Photo by Nigel Clark. All looked dismal until our neighbours Reg and Rowena Langston said that we could build the aviary in the field they owned at the side of their house. The aviary was built over a two day period by Nige and Roland from WWT and in February 2016 the Dunlin moved in. 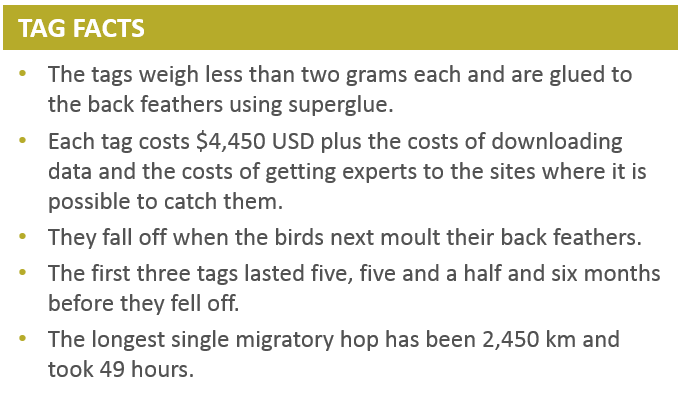 On the third of March we glued six dummy 2 gram tags on the back of half the birds. In the following days we watched intently to see if the tagged birds behaved unusually. We could see no effect at all. The only way to distinguish the tagged from the control group was by seeing the tag or reading the colour rings. It was as if they were unaware of their presence. After 46 days one tag came off but the rest stayed on for over 100 days and only fell of when the birds went through their annual moult. Paul and his wife Julia brought us a real tag on 19 April and we glued it on wondering if it would work and when we would know. It did not take long! The next day Paul sent an email to say that we had had a good fix so finally after six years we had a method of remotely tracking spoonies. So where was the best place to put on our first tags? There are many things that we do not know about spoonie migration wintering and breeding sites but there are few places that we know that we could safely catch spoonies. The two realistic options were either in Jiangsu China where, working with Professor Chang Qing from Nanjing Normal University, we had caught 10 in autumn 2015 or on the breeding grounds where is possible to catch them on the nest. We opted to put three tags on in China and BTO, RSPB and WWT each agreed to put in £7,000 to the project. The problems did not end there. Getting all the necessary permits to ring birds and to put on tags in China is a long process that takes a lot of time and the autumn catching window was coming very rapidly. We decided that we had to book flights without all the permissions in place and thanks to the British Airways Community and Conservation Programme, we were given Business Class free flights which was great to take all the equipment out. Professor Chang Qing came to the rescue and sorted all the permits two weeks before we were due to fly. We arrived at Heathrow Airport thinking that it would be straightforward from here, we just had to get an export permit stamped for us to claim back the import tax for the tags. I went to the counter with the form, only to be told it was not filled in correctly and that I should go and get another one signed by the WWT office and come back another day! We had been told by HM Customs that they would help us if anything was not correct but the supervisor was not going to help at all! We were at a point of despair after all the work that had gone in to getting this far when someone further back in the queue said “maybe I could help you” Jon Dew of Five Star Freight Systems was waiting for a client to help them through the process and quickly modified the form and then returned with me to the desk. As I handed it over he said that it WAS all in order now and clearly they were not going to argue with him and duly signed and stamped the form. It was one of those days that your faith in human nature is restored! We arrived at Rudong ready to hit the ground running only to be told that the edge of a cyclone was due there for the next three days – it was going to be windy and rain a lot. We had two hours of daylight left and the weather was calm so we decided to test fire the cannon netting equipment that Prof Chang had expertly made to the specification that we had sent over from the Wash Wader Ringing Group’s designs. We fired the net four times, each time with a bit more gunpowder until we had got the right amount to take the net out. So we were all ready to go but hoped that the forecast was wrong. It was not! For the next few days we got soaked observing flocks huddled behind any shelter they could find. In these weather conditions there was no way we could use any of the catching methods that we had available. We did try dazzling but only caught a couple of plovers as there was too much ambient light from the nearby factories. Finally the wind abated enough for us to set a net where there were 3,000 small waders and three spoonies. It was going to be like finding, or more accurately catching (! ), a needle in a haystack. To add to the problems the birds were used to lots of rubbish on the site but had never been caught with cannon nets so they just saw them as rubbish and ran all over them (we obviously couldn’t fire the nets if there was any danger to the spoonies or any of the other waders). We eventually caught 80 waders but no spoonie. That evening we discussed the way forward and decided that we would have to build a netting wall round the net to keep them off. Normally we try to hide cannon nets as much as possible but this was just making it very obvious! It worked and next day we couldn’t wait until a spoonie walked into the catching area before we fired. When we examined the spoonie it was still growing the back feathers that we needed to glue the tag to so it was unsuitable for tagging. A real blow as time was running out. After a couple more fruitless days we caught a juvenile spoonie but again we were not going to tag juveniles as they are not necessarily going to migrate to the same sites as the adults. We had found another flock of 8,000 Dunlin with three spoonies in it so we tried to cannon net them the next day. The birds duly arrived and 400 Dunlin were in the catching area but the only spoonie was at the other end of the flock a long way from the net. David Melville was dispatched to try to move the spoonie into the catching area. We did not have much hope but slowly it got closer and closer. Then we lost it in the flock when there was a fly round. After a few minutes there it was in the catching area! As soon as we had double checked that it was safe to fire we made the catch and rushed to get it out – we looked at the birds caught under the net but it was not there. Then Guy Anderson saw it. This time it was suitable to tag. Being the first satellite tagged spoonie we had to give it a distinctive tag so it had to be ET. From this time on we all hoped ET would call home! 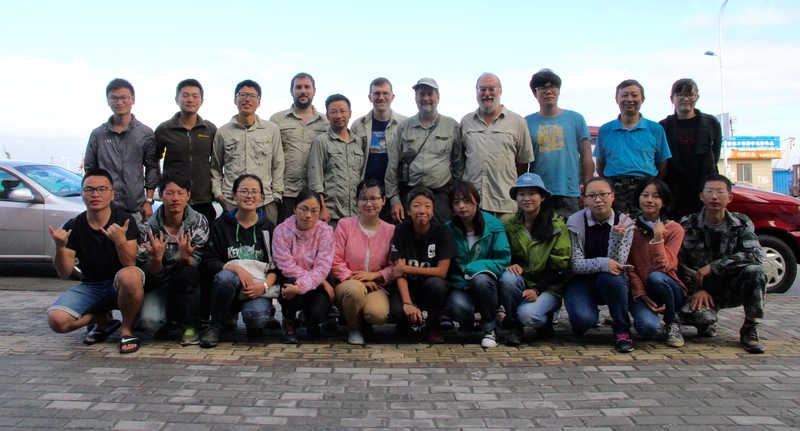 Yellow ET at the Minjiang Estuary, Fujian, China on 29 October 2016. Photo by Du Feng-luan / Fujian Bird Watching Society. Although we had all put on many tags in the past and had practised tagging birds the size of spoonies, we were incredibly nervous of tagging a real one. The practice meant that it all went like clockwork and we released ET who flew 200 metres and then fed on the edge of a ditch for a bit before returning to the mudflats. As soon as we had caught Guy went in search of other sites to catch and came back with a lagoon with at least 30 spoonies on it. We had two days until we had to leave and it was not suitable to mist net that night so the next day we set the cannon net and an elastic powered ‘whoosh’ net on the pools that the birds had been seen on the day before. By the time that the birds arrived, the pools had dried out a lot and it took a lot of time to get spoonies in the right place. We were exhausted by this point and, in our checking of the set nets, we were over cautious and so failed to catch the spoonies that we thought were in front of both nets. We were gutted! We had 24 hours left so decided to mist net on the lagoon all night. It paid off – we caught three spoonies – the first was a juvenile but then we caught two spoonies in the same net! One was perfect for tagging and was duly tagged (HU). With 12 hours left we cannon netted on one lagoon and whoosh netted on a second. Remarkably we caught three more spoonies and managed to put on our last tag (CT) with just enough time to rush back to pack and have a celebratory meal with Prof Qing and his students before leaving for the airport. The tags just needed to do their thing and they have. Six months on all three have just fallen off after transmitting data, sometimes three fixes in a day. They have enabled us to find new stopover and wintering sites and one (CT) has enabled us to find an area in southern China with at least four other wintering spoonies that was not known about before. This site was visited by Jonathan Martinez who was horrified to find large numbers of mist nets set to catch waders. The State Forestry Administration was alerted and the next day the nets were removed giving these spoonies a better chance of surviving the winter. HU also wintered in China and the mayor of the local village put up signs saying that there is no hunting here and that the birds are safe. The third bird, ET, wintered in the largest known wintering site in the Bay of Mottama in Myanmar. It gave regular fixes which enabled us to understand where it moved to on neap tides at a time that we cannot follow the spoonies there as the water levels in the estuary are not high enough to use boats to get around the massive mudflats. In the coming years we hope to learn more of the secrets of spoonie movement patterns thanks to the developments that Paul has made and the many dedicated volunteers who have worked tirelessly to make this happen. What a fantastic report thank you Rebecca. You guys are all amazing and thank goodness for the clever boffins who have created such an incredible tag that works and does not fall off for so many months. Wonderful work. Really appreciate these writeups. Enthralling to read. Just love these Spoonies! Hope you have some great successes this season too. Good Luck.